On the 15th of September, we celebrated the feast of Our Lady of Sorrows. It is a great devotion to have/remember because no matter what we suffer we always have an understanding Mother to turn to who will make our sorrows lighter. 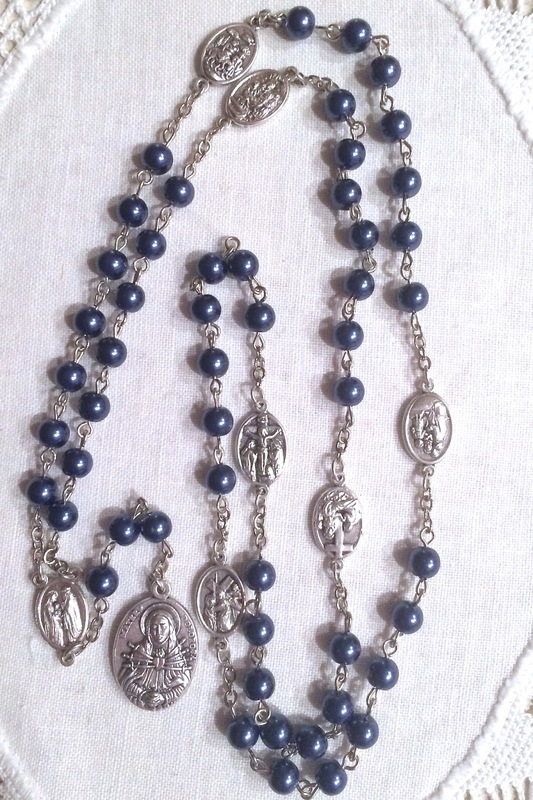 The chaplet pictured consists of meditating on these mysteries/sorrows of Mary, while praying an Our Father and seven Hail Mary's. (It will soon be available for purchase at handmadecatholicshop.com!) The chaplet originated in the 13th century to honor and meditate upon the moments Our Lady shared most deeply in the Passion of her Son. Sometimes in our lives when we can't understand why we should suffer and think that God should take away all our troubles because He is God, it is helpful to turn to Mary, who willingly suffered in union with Jesus in order to bring about our salvation. This is all God asks of us---a willingness to suffer, that is, to accept our trials for love of Him and to remember that we can never suffer as much as Jesus and Mary did for us. In our darkest moments, we have to remember that all we endure is but little repayment for the price Our Lord and Our Lady paid for us. Words of St. Bernard: "All of you, who see yourselves amid the tides of the world, tossed by storms and tempests rather than walking on the land, do not turn your eyes away from this shining star, unless you be overwhelmed by the hurricane. If temptation storms, or you fall upon the rocks of tribulation, look to the star: call upon Mary."